Maybe they want a new plush carpet installed. That is always an option. The feel of a nice, cushiony carpet under your feet just after you get out of bed is a wonderful feeling. Not only that, but you get to avoid putting your tender feet on the cold floor, you have that wonderful buffer of warmth. Carpeting definitely has its positive aspects, however, it has it’s negative aspects as well. For example, it can become quite expensive. For a typical square room, that means no funny angles or partitions, that is 12 feet long and 12 feet wide will cost you anywhere between $300 and $750. And this isn’t even for higher end carpets materials, it is only low grade to middle-grade carpeting. Cost isn’t the only factor. In five or ten years down the road will that carpet still be fresh or will it be time for another replacement? Carpet can last if it is properly maintained and cared for, and even the priciest materials will only last so long. Eventually, that carpet will need to be replaced again. How About a New Hardwood Floor? Others choose to go for a nice hardwood floor. There are multiple reasons to decide on a nice hardwood floor. My favorite aspect of hardwood flooring is the appearance. I’m not exactly sure why, but I have always found the mood and ambiance given off from hardwood floors to be very soothing. My grandmother always had hardwood floors in her living room and my cousins and I would play there for hours. Yet another reason some people choose hardwood floors, they have children or pets. Anyone that is a parent or animal owner knows that being a taking care of another living creature can be a messy business. Having to clean carpets after children or pets is no small feat. Spilled sodas, crumbs from snacks, or any number of other catastrophes will affect your carpet for years, wearing it down and staining it. Hardwood floors, on the other hand, are much easier to maintain and clean. Hardwood floors, unfortunately, are out of the price range of many people. Earlier I mentioned putting carpet into a perfectly square room and it costing between $300 and $750. This price includes most installation fees. For that same room, 12 feet long and 12 feet wide, a person can expect to pay an average of $10 per square foot, bringing the average total to around $1,440. That is over double what you would pay for most mid-range carpeting. “No way, you couldn’t really use plywood as flooring, right?” I hear you ask. And you would be completely surprised. Plywood is extremely durable. When plywood is made it is done so in layers. This layering causes the material to be very stable and very strong. Not only that, it’s durability allows it to be used in multiple climate types. I’m sure many of you have an image of plywood in your head right now and you still can’t see the way it would work. Well, much like typical lumber, plywood has its own grades. There are many types of plywood available, far too many to discuss them in their entirety. The types typically used for flooring are A and B rated, the primary difference being that the A side of plywood is typically sanded to a smooth finish. If you have the tools and equipment you can actually save yourself quite a bit of money by doing the sanding yourself. Speaking of money, what is the cost of plywood flooring. We mentioned the cost of carpeting and hardwood flooring. We know that for carpeting you will pay anywhere between $2 and $6 per square foot for low to mid-range carpeting. We also know that for hardwood flooring you would pay an average of $10 per square foot. It’s fairly obvious that plywood flooring is going to be cheaper, but the real price difference can be quite shocking. People that choose plywood as there flooring option pay, on average, around $1 per square foot. No, that is not a typo. The average cost of plywood for your new flooring option will be around $1 per square foot depending on the type and grade you choose. 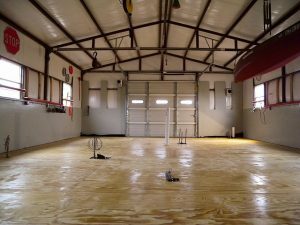 The two most important things that you will need to consider when installing your plywood flooring is going to be the quality of the plywood you get and the tools that you are using. Since we already talked a bit about the quality and grading of plywood, let’s go ahead and discuss what tools you will be needing. The tools I am mentioning here are not all-inclusive. There may be specific instances in which you need something more than what is mentioned here in this article. Likewise, you may not need some of the tools that I mention. Make sure you get the tools that you need; it would be a shame to have to make several trips to the hardware store to get more tools. On the other hand, don’t go overboard and by tools that you will only use maybe one time. Shop Knife: This is an excellent tool to have, especially if you are replacing the carpet. The shop knife will help you to cut the carpet out where necessary and, in general, it is a good tool to have around the house. I actually own three different shop and utility knives. Saw: A table saw or a circular saw and saw horses will be a necessity. You are going to have to cut your plywood sheets in order to have them fit properly into your chosen room. If you have access to a table saw I highly recommend it for ease of use. If not, a quality circular saw is never a bad option. 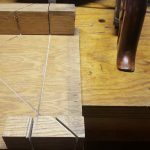 Measuring Tape: You are going to need a measuring tape or a yardstick or some kind of measuring device that you can use to accurately cut your plywood to shape. Speaking of shape, you should have a steel square available as well. This will help to make sure that you maintain the appropriate angles. Pry Bar: If you are replacing the flooring a pry bar is going to go a long way in helping you to remove the unwanted remains of the previous floor, whether that be hardwood or carpet. Hammer and nails: You want a hammer that you are comfortable holding and you want to have plenty of finishing nails. Much like I mentioned earlier, you don’t want to have to stop working so that you can run to the hardware store to pick up more nails. In this case, it is far better to have too many than not enough. Painter’s Tape: This is going to help to protect your walls and baseboards once it comes time to apply a coating to your finished plywood floor. I like to use this in conjunction with one of my shop knives in order to ensure I get nice straight lines. These are just some of the biggest and most used tools that you will need. I recommend doing additional research based on your personal needs in order to ensure you have everything that you need. So now you have chosen your plywood, you have gathered all of the necessary tools, and you are ready to get started. How do you do that? How do you get started? Obviously, the first step is going to be to clear out the old flooring. For me, I had to clear out a carpet. Start by using the shop knife to cut up the carpet and pull it out. Then you will move on to removing the carpet pad. This is probably my least favorite step in the entire process, as the pad is both glued and nailed down. You will have to work for this one, at least I did. Once the pad is up, you then have to pull up all of those nails that were holding the carpet and its pad in place. If you followed my recommendations then you have a nice pry bar that can help you get up all of those pesky nails. Now, you have to play the waiting game. At this stage, you need to apply some kind of protective sealant to the subfloor in order to keep the material strong and healthy for years to come. Now comes the fun part, installing the plywood. Installing plywood isn’t that far off from installing other types of flooring. If you have gotten this far you probably already know how wide you want each strip of plywood to be, and you have likely already cut those strips down to size. All you need now is your have, nails, and some adhesive (preferably of the construction variety) to get this all in. Always check your measurements. Another tip I like to share: Don’t throw away your scrap plywood right away. You will likely find that you need an odd shaped piece and instead of cutting out of fresh plywood you can use a piece of scrap of to the side. Waste not want not. I really like the look of the polyurethane coating, so that is what I went with. There are many options available for stains that you can use to liven up the look of that plywood floor. I’m about to tell you my favorite. So maybe you want something a bit more appealing than just plywood. Maybe you want the ease clean option of the hardwood and plywood flooring but you want some kind of intricate pattern that catches the eye. Well, on great option for you would be to burn that floor. That’s right, you take a small torch to it and you burn whatever pattern you desire into it. I actually burned patterns into my prior to installing the plywood, then I put the strips down in a random order to give it a sporadic and random burned feel to it. There are some important things to keep in mind when attempting this though. I recommend keeping a bucket of water with a couple sponges close by. You don’t want to leave the flame on one spot for too long, and you absolutely don’t want to leave anything smoldering. If something gets too hot, put a wet sponge on it to cool it down. Once you have a good pattern going, you want to sporadically sand the whole floor to help it maintain smoothness. I did this a few times, applying darker layers first and then lighter layers on subsequent passes. It ended up looking wonderful and I recommend this project to everyone that will listen!